Producing ITER's ring-shaped poloidal field magnets is a multi-stage process requiring at least 18 months per coil. Lengths of niobium-titanium (NbTi) superconductor are progressively wound into flat, spiralled coils called double pancakes, impregnated with resin, and finally stacked and assembled to form finished magnets that weigh between 200 and 400 tonnes. The European Domestic Agency completed an on-site manufacturing facility in 2012 for the fabrication of the largest poloidal field coils and, today, the building is being progressively equipped with the handling and tooling equipment required for the first qualification activities to get underway in mid-2016. From a contractual point of view, six work packages will cover the full process of poloidal field coil fabrication, including overall engineering integration, tooling, site and infrastructure management, manufacturing, and cold testing. Contracts signed to date by the European Domestic Agency include those for winding tooling (SEA ALP Italy), site and infrastructure (Dalkia-Veolia France), engineering integration (ASG Superconductors, Italy) and, in the latest news, the contract for the supply of handling and impregnation tooling. Impregnation is the step in fabrication that intervenes after the conductor has been wound and insulated. The double pancakes are lowered by crane into moulds for vacuum pressure impregnation (VPI) with epoxy resin. 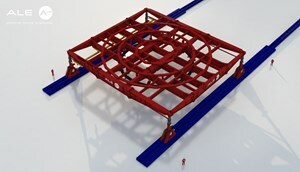 Under the effect of heat, the resin bonds each double pancake into a rigid assembly. The contract signed between the European agency and a consortium formed by Elytt Energy and Alsymex (Alsyom and SEIV) includes the design and manufacturing studies, fabrication, and on-site assembly, commissioning and testing of the impregnation equipment. Handling equipment is also included in the scope of the contract, such as specialized equipment to lift, insulate and stack the pancake layers, a gantry crane with a load capacity of 400 tonnes, and assembly stations.